The visual pathway is tasked with processing incoming signals from the retina and converting this information into adaptive behavior. Recent studies of the larval zebrafish tectum have begun to clarify how the 'micro-circuitry' of this highly organized midbrain structure filters visual input, which arrives in the superficial layers and directs motor output through efferent projections from its deep layers. The new emphasis has been on the specific function of neuronal cell types, which can now be reproducibly labeled, imaged and manipulated using genetic and optical techniques. Here, we discuss recent advances and emerging experimental approaches for studying tectal circuits as models for visual processing and sensorimotor transformation by the vertebrate brain. The transformation of visual sensory inputs into motor and endocrine responses requires specialized neural processing, often distributed across multiple structures or pathways in the brain. A classical and still vigorous branch of neuroscience, best referred to as 'functional neuroanatomy', assigns functions to specific areas in the brain. The interconnectivity of multiple areas involved in a particular sensory or behavioral task are often represented using a set of boxes, connected by arrows. The most famous such wiring diagram identified roughly 40 visual processing areas in primates . Similar 'macro-circuits' have been drawn up for the visual pathway of 'lower' vertebrates . In toads, a detailed circuit underlying prey capture behavior has been derived from heroic work over three decades involving tract tracing and electrophysiological mapping  (Figure 1a). However, none of these studies has generated a comprehensive list of essential circuit components (cell types and their connections) for a specific behavior or the processing of a specific visual stimulus. This gap in our knowledge of 'micro-circuitry' is a major obstacle to understanding the mechanisms of perception and behavior. Classical and neoclassical methods of parsing the visual system. (a) Neural network underlying prey capture in anuran amphibians . Anatomical studies from 1969 to 1999 were compiled to show the complex interconnectivity of visual and olfactory inputs, forebrain and midbrain contributions, and motor outputs. The retina is boxed in blue, and retinorecipient regions are boxed in red. Such schemes provide a framework for further study but do not address the pathways' micro-circuitry. A, anterior thalamus; PT, pretectum; OT, optic tectum; R, retina; V, ventral thalamus. Modified from . (b) Scheme showing the major retinofugal connections in the larval zebrafish. Colored circles are stand-ins for diverse cell types, already known or yet to be discovered. The quantities in parentheses are estimates of the number of cell types (data compiled from work on zebrafish and other cyprinids). The retina comprises three cellular layers with five types of photoreceptors (4 cones, 1 rod), at least 11 bipolar cell types, about 70 amacrine cell types , and so on. The number of tectal neuron types is also large. Distinct RGC types (colors) likely have specific roles and connections with ten retinorecipient arborization fields (AF1 to AF9 plus AF10, which is the tectum) in the brain. Some anatomical details (as far as known): the RGCs that are connected to AF7 project a collateral to SO; RGC axons projecting to SAC/SPV in the tectum are routed through AF9. Abbreviations: AC, amacrine cell; AF, arborization field; BC, bipolar cell; GC, ganglion cell; HC, horizontal cell; INL, inner nuclear layer; IPL, inner plexiform layer; OPL, outer plexiform layer; PhR, photoreceptor; PVN, periventricular neuron; SAC, stratum album centrale; SFGS, stratum fibrosum et griseum superficiale; SGC, stratum griseum centrale; SIN, superficial interneuron; SO, stratum opticum; SPV, stratum periventriculare. The zebrafish has emerged as a valuable model system with which we can hope to close this gap [4–7]. Ten different anatomical areas have been identified that serve as targets for the retinal ganglion cell (RGC) axons that connect the eye to the brain  (Figure 1b). These ten arborization fields, referred to as AF1 to AF10, probably correspond to the primary visual nuclei identified in adult teleost fish and are homologous to areas in mammals, such as the suprachiasmatic nuclei (AF1), the pretectal nucleus of the optic tract (AF9) and the superior colliculus/optic tectum (AF10). Not very much is known about the behavioral functions of these arborization fields in zebrafish or other fish species (with the exception of the optic tectum - see below), but it is clear that specific visual functions are initiated by activation of a fixed complement of one or very few of these nuclei . Table 1 contains a comprehensive list of visually evoked behaviors reported for zebrafish. Here, we focus on the larval zebrafish tectum (AF10), a structure suitable for circuit analyses. The tectum sits at the surface of the brain (its name means 'roof' in Latin) and is therefore accessible to electrophysiology, laser ablations, optical imaging, and control of neuronal activity with optogenetic effectors. The tectum's broad function is known; it is involved in tasks that require a map of visual space, such as phototaxis, the approach of prey or the avoidance of obstacles (Table 1, third column). The tectum converts a visuotopic sensory map into a map of directed motor outputs. An intact tectum is dispensable for measurements of ambient light levels or for reflexes to broad moving stimuli, such as optomotor or optokinetic responses, visual background adaptation, the dorsal light reflex or photo-entrainment of circadian rhythms. In the laboratory, these behaviors can serve as negative controls for the specificity of tectum manipulations. The tectum's cellular architecture is beginning to be understood, providing an opportunity to match the structure of its micro-circuitry to its function. The zebrafish tectum is amenable to genetic manipulations. Some of the mutants and transgenic lines useful for analysis of tectal visuomotor function are summarized in Tables 2 and 3. Important contributions to the renaissance of interest in the tectum's inner workings have also been made in Xenopus tadpoles. We will be lumping efforts in fish and frog together here, as they are truly complementary, each capitalizing on specific experimental advantages of the two systems. The zebrafish larval tectum is roughly divided into two regions, a deep cell body layer, the stratum periventriculare (SPV), and a superficial neuropil area, which contains the dendrites and axons of tectal neurons, a sparse assortment of tectal interneurons and afferent axons arriving at the tectum, chiefly from the retina (Figure 1b; colored circles indicate the diverse tectal cell types - see next section). Tectal processing begins with visual signals transmitted via the axons of RGCs. These axons enter the zebrafish tectal neuropil from the anterior end at six levels corresponding to the six retinorecipient laminae (Figure 1b) . A similar pattern has been observed in adult teleosts . As a strict rule, each RGC axon is targeted to a single lamina and arborizes exclusively in this lamina . Most (80%) RGC axons innervate three sublayers of the stratum fibrosum et griseum superficiale (SFGS). A smaller number (15%) innervate the most superficial stratum opticum (SO). The remaining RGC axons (5%) project into the stratum griseum centrale (SGC) and into the interface between the stratum album centrale and the SPV (SAC/SPV). Each retinorecipient lamina is topographically organized: retinal axons project into the plane of each layer in a visuotopic order, such that the retinotectal map is in fact an array of six parallel maps stacked on top of each other. Objects in the forward visual field of the contralateral eye are represented in anterior tectum, whereas objects behind the fish are mapped to the posterior tectum. Objects in the upper visual field activate the dorsal (medial) tectum, whereas the ventral (lateral) tectum responds to visual stimuli from below the fish. 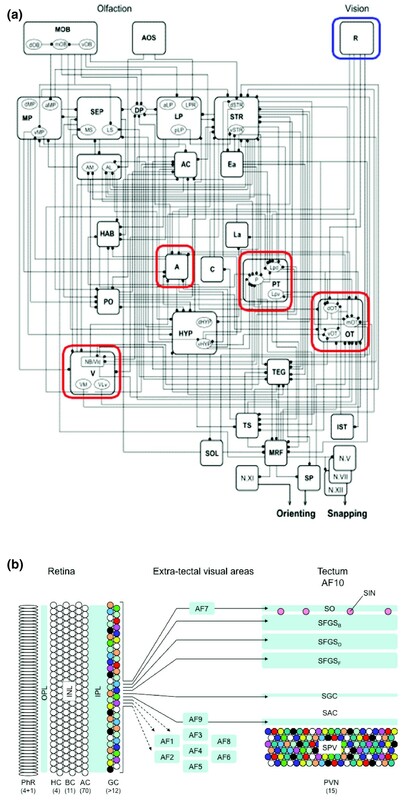 This fine-grained map is thought to allow the localization of a stimulus in the visual field. Several general rules govern information processing in the fish tectum. Information flows primarily from the superficial layers to the deeper layers. The vast majority of retinal afferents enter the superficial layers of the tectum, where they make excitatory (glutamatergic) synaptic connections with the dendrites of tectal interneurons. The information then travels along the vertically oriented dendrites of the periventricular neurons (PVNs) to the deeper layers . As a demonstration of this, Kinoshita et al. labeled tectal slices of adult rainbow trout with a voltage-sensitive dye and imaged the propagation of activity as current was applied to the anterior pole of the SO and SFGS. This cross-sectional view of the working tectum confirmed that the wave of depolarization proceeds in a stereotyped pattern. Fast depolarization travels anterior to posterior in the SO and SFGS, presumably along the paths of RGC axons. At each point along the anterior-posterior axis, a slower vertical depolarization is triggered, proceeding radially to the deeper SGC and SAC. In the deeper neuropil layers, information is transmitted from the axons of interneurons to other interneurons or to tectal projection neurons that send axons to premotor areas in the midbrain and hindbrain. Intratectal connections are inhibitory (releasing the neurotransmitter γ-aminobutyric acid (GABA) and thus called GABAergic) or excitatory (releasing glutamate; glutamatergic). In addition, a small percentage of PVNs are cholinergic (releasing acetylcholine). Tectal outputs from the deeper neuropil layers are wired to the appropriate combination of premotor nuclei to govern behavioral responses. The cell bodies of most tectal neurons are spatially removed from the site of actual processing, which seems to take place exclusively in the neuropil. The cell body is not required as an intermediate between input and output because of the peculiar 'monopolar' morphology of fish tectal cells, which are reminiscent of insect neurons. The dendritic segments of the neurites are contiguous with the axonal segments. In the voltage-sensitive dye recordings mentioned above , the SPV was not detectably activated, suggesting that the bulk of activity 'fades' in the proximal neurites before it reaches the cell bodies. This cellular architecture probably has functional implications. Bollmann et al. imaged individually dye-loaded tectal neurons in Xenopus tadpoles. Their study demonstrated that visually evoked dendritic calcium elevations are unevenly elicited across individual dendritic trees in a pattern consistent with the retinotopic map. Given that many tectal neurons have axons that emerge from among the dendritic branches, different levels of activation across the dendritic arbor might influence neuronal output differently. If so, dendrites nearer the initial axon segment would have more influence than more distal branches in spike generation. It is not clear how this bias, favoring certain retinotopic positions over others, might contribute to the shape of the PVN's receptive field. Studies of genetic mutants have helped to identify mechanisms that govern the processing of visual information in the zebrafish tectum (Table 2). One example is the blumenkohl mutant, which shows a selective deficit in the capture of small prey items (but not large ones). This impairment is due to a deletion of vesicular glutamate transporter 2, encoded by the vglut2a gene. In response to decreased levels of glutamate at retinotectal synapses, the arbors of retinal axons become enlarged, resulting in an increase of the receptive fields of tectal neurons . Accurate processing of visual stimuli requires spatially precise vertical streams of activity that subsequently recruit small subpopulations of projection neurons to initiate a motor response. In blumenkohl mutants, these parallel processing streams are less precisely aligned owing to a greater overlap of receptive fields among neighboring tectal PVNs. This seems to degrade either visual acuity or motor control (or both). Early electrophysiological recordings found heterogeneous responses among tectal neurons in adult zebrafish . Some neurons were responsive to looming stimuli, others to moving edges or to objects of a certain size range. The colored circles in the schematic drawing in Figure 1b represent this diversity. Calcium imaging studies refined this work, showing that these distinct tuning properties arise early and are largely constant during embryonic and early larval development . For these studies, larvae had their tecta loaded with a calcium indicator dye and were mounted with a miniature liquid-crystal display (LCD) screen for projecting images to the eye, and calcium signals from tectal cells were recorded by two-photon laser-scanning microscopy. PVNs could be sorted into numerous types according to their tuning profiles. Although some were broadly responsive, showing spontaneous and sustained activity in the dark, others were altogether unresponsive to the visual stimuli tested. However, the majority of PVNs were sensitive to spots in the visual field, with optimal responses to either stationary flashing spots, moving spots regardless of their size or direction, or small spots moving in particular directions. Thus, PVN ensemble activity probably encodes information about the location, size and movement of small objects in the visual field, evidently supporting the behavioral functions of the tectum. A landmark neuro-anatomical study, using the Golgi labeling technique, in adult goldfish, a species closely related to zebrafish (both are in the family Cyprinidae), catalogued tectal neuron types on the basis of cell body location and neurite arborization pattern  (Figure 2a). (Golgi-labeling is a classical neuroanatomical technique for sparsely labeling neurons; it shares a name - from the physician scientist Camillo Golgi - with the cellular compartment, but is functionally unrelated.) Anatomical surveys of transgenically labeled neurons have now extended this classical work to larval zebrafish. In a screen, our group [20, 21] identified three enhancer trap lines with strong and fairly specific expression of our Gal4 trap construct in tectal cells (Table 3). To examine individual neuron morphologies, we crossed these fish with carriers of a highly variegated UAS:mGFP construct contained within the Brn3c:Gal4, UAS:mGFP (BGUG) transgene (Table 3; GFP refers to green fluorescent protein and Brn3c to a member of the POU domain transcription factor family that is expressed in specific neurons). This method allows the visualization of single or sparse neurons with a membrane-targeted GFP. A distinct subset of these tectal neurons has been further characterized using a Dlx4/5:GFP transgenic reporter (ER, SJ Smith and HB, unpublished work). Together with single-cell electroporations labeling random subsets of tectal neurons with GFP , such 'genetic Golgi' stains have yielded a preliminary catalog of neuron types in larval zebrafish tectum (Figure 2b). 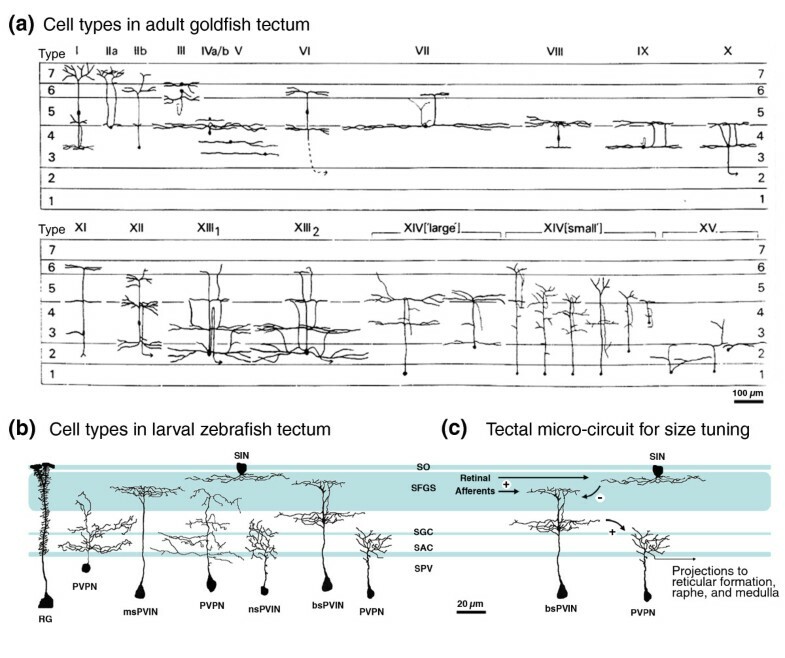 Importantly, many of these neuron types resemble miniature versions of those described in the adult goldfish (compare Figure 2a and 2b) and other teleosts [23, 24]. Cell type diversity and (some) functional connectivity of the fish optic tectum. (a) Cells described from classical Golgi studies in the adult goldfish tectum . Fourteen types of neuron were identified on the basis of cell body position and morphology. Modified from . (b) A sampling of neuron morphologies observed in the larval zebrafish tectum using 'genetic Golgi' methods. These include: radial glia (RG), periventricular projection neurons (PVPNs), periventricular interneurons (PVINs) and superficial interneurons (SINs). Retinorecipient laminae in the tectum are indicated by shading. Note the diverse dendrite morphologies of both projection neurons and interneurons in the tectum. In particular, PVINs have been observed containing arbors that are non-stratified (nsPVINs), mono-stratified (msPVINs) or bi-stratified (bsPVINs). (c) Hypothetical neural circuit responsible for size tuning of PVNs in the optic tectum . Retinal afferents targeting the superficial layers of the SO and SFGS form excitatory synapses onto PVINs containing superficial dendrites and an axonal arbor in a deeper layer. These PVINs may mediate the vertical flow of excitation in response to small visual stimuli by activating PVPNs with dendrites located in deeper neuropil layers. In contrast, large visual stimuli additionally activate SIN cells, which inhibit the PVIN-mediated vertical flow of information to PVPNs. A quarter of the neurons in our survey [20, 21] have cell bodies in the SPV, radially oriented dendrites that reach to the superficial, retinorecipient layers and a local axon. We call this group the periventricular interneurons (PVINs). Little is known about their function. A substantial fraction of PVINs are GABAergic (the rest being glutamatergic or cholinergic), and these may filter incoming signals by inhibiting responses to non-salient stimuli. Feedforward inhibitory connections need to be in place for gain control given the high ratio of retinotectal axons to tectal efferents (neurons projecting from the tectum), estimated to be between 30:1 and 100:1 . Most other periventricular neurons (70%) have axons exiting the tectum, reaching the hindbrain reticular formation, the medulla or the Raphe nucleus . As a rule, these periventricular projection neurons (PVPNs) have dendrite arbors in the deep and intermediate regions of the neuropil, but not in the superficial SO/SFGS zone [20, 25, 26]. This morphology reinforces the observation that information flows chiefly from superficial to deep  and further suggests that processed, rather than raw, visual information governs tectal output. A study  of efferent projections from the deep layers of the tectal neuropil to the hindbrain suggests that spatially patterned tectal outputs may help coordinate motor responses. The tectobulbar tract is composed of ipsilateral and contralateral projections to premotor structures in the hindbrain reticular formation. Hindbrain target neurons, in turn, project to primary motor neurons in the spinal cord. Sato et al. used a clever combination of Gal4/UAS and Cre/LoxP systems to label small numbers of PVPNs, allowing a direct comparison of retinotopic position of tectal cell bodies with the hindbrain targets of their axons. Each mini-region of the tectum projects axons to a wide array of hindbrain segments (rhombomeres); for example, one area the size of a single retinotectal arbor had projections to almost all rhombomeres. These observations support a model in which tectal output from a small region reaches multiple premotor sites in order to coordinate a full body response. The topographic organization of tectofugal projections to the reticular formation is functionally important, as shown in mammals, amphibians and fish [28–32]. In goldfish, anterior tectal efferents preferentially innervate midbrain sites that generate small horizontal eye movements, and posterior efferents innervate sites associated with large saccades (fast reset movements). In larval zebrafish, there is a similar mapping of tectal efferents onto the reticular formation . Posterior tectal neurons are more likely to project to rhombomere 2, whereas middle to anterior neurons are more likely to innervate rhombomere 6. This suggests that the behavioral responses that are controlled by the reticular motor map are tailored to the location of the visual stimulus (as they should be). Although we do not know the identity or function of neurons in rhombomere 2 that receive input primarily from the posterior tectum, we predict that they have a role in executing a behavioral response, perhaps a large horizontal saccade or a turning response, to stimuli behind the animal. The role of local inhibition in the tectum for visual discrimination has been brought to light in two studies. In the first, Ramdya and Engert  surgically removed one tectum from a developing zebrafish embryo, which resulted in bilateral retinal innervation of the remaining tectum. This allowed them to characterize the binocular response properties of normally monocular tectal neurons. As in monocular tectum, binocular tectal neurons sometimes responded to motion in a direction-selective manner. Even a stripped-down motion stimulus, consisting of a dot jumping between two movie frames from left to right, generated a response. The authors exploited this unnatural binocular response to ask how motion sensitivity is generated in the tectum. They created an artificial 'motion stimulus' visible only to a binocular cell by parsing the dot's jump between the two eyes: one movie frame was shown only to the right eye and the other frame only to the left eye. Interestingly, this two-frame movie was sufficient to stimulate direction-sensitive tectal neurons. Given that neither retina's signal, on its own, could encode motion direction - each was shown a flashing, stationary dot - it can be concluded that circuitry intrinsic to the tectum underlies this sensitivity. These results are consistent with a model in which a direction-sensitive cell responsive to motion in the anterior direction is flanked anteriorly by retinorecipient cells that inhibit its activity. The direction-sensitive cell is therefore inhibited by its anterior neighbors and shows reduced activity when activated by a stimulus moving in a posterior direction across its receptive field, but responds more vigorously to an anteriorly moving spot. A similar model partially accounts for the directional selectivity seen in neurons of mammalian visual cortex [34, 35]. The Ramdya and Engert study  showed that such a direction-sensitive circuit exists in the zebrafish tectum and that it is probably hardwired (genetically specified). The role of a specific, anatomically identified class of tectal inhibitory interneurons has recently emerged in another calcium imaging study carried out in our laboratory . This work used the enhancer trap lines generated by Scott et al. to express the genetically encoded calcium indicator GCaMP in specific populations of tectal cells in order to image response dynamics in different tectal layers. As previously observed in the superior colliculus of mammals and corroborated in the larval zebrafish  (see above), many tectal neurons respond most strongly to small spots or bars in visual space. The new results identify a synaptic basis for this small-spot bias. When presented on a small LCD screen, all visual stimuli registered post-synaptic responses in the superficial neuropil (SO and SFGS), but only for spatially restricted stimuli were these signals fully propagated into the deeper neuropil (SGC and SAC). Tectal administration of bicuculline eliminated this size selectivity - in the presence of this GABA antagonist, large (50°) stimuli elicited responses in both superficial and deep neuropil. This implicates GABA-based inhibition in tectal filtering . Further work was able to identify the cell type responsible for the selectivity . With another Gal4 line, a type of interneuron called a superficial inhibitory neuron (SIN) could be labeled, whose cell body resides between SO and SFGS (Figure 2c). These cells have broad arbors in the SFGS, are GABAergic, and are probably homologous to Meek and Schellart's type III neurons (Figure 2a) . Calcium imaging showed that these cells have the unusual property of responding to full-screen stimuli (and not to small stimuli). These data raised the possibility that SINs may be mediating the small spot selectivity of tectal filtering. To demonstrate their necessity in this process, SINs were photo-ablated with KillerRed . This lesion had a similar effect to the application of bicuculline; deep tectal neuropil layers responded to large and small stimuli alike. Moreover, silencing of synaptic transmission by SINs with the tetanus toxin light chain impaired the fish's prey capture behavior, but not optomotor responses, a behavior independent of the tectum . The new experiments  are the first elucidation of the role of a morphologically and genetically designated cell type in tectal processing. The tectum integrates and processes visual information for export to premotor targets. Several steps in this sensorimotor transformation are still mysterious. The rules governing the PVIN to PVPN transmission are unknown, as are the contributions of afferent inputs to the tectum from diverse brain regions and sensory modalities [39–41]. And although efferent targets have been identified anatomically, we know little of the spatial or temporal patterns of tectal output activity. Even more mysteriously, tectal circuitry shows oscillations of activity in response to a periodic visual stimulus, which can continue long (tens of seconds) after the stimulus has stopped. These entrained mental 'reverberations' can even drive rhythmic motor activity . We do not know which neuronal networks carry these oscillations, and whether they could potentially provide a substrate for working memory. A complete catalog of cell types, together with a comprehensive description of their connections within the tectum and beyond, will be useful to deduce this and other computations carried out by tectal micro-circuits. Given the tectum's superficial position in the dorsal brain and the transparency of larval zebrafish, these questions can now be addressed using in vivo imaging and emerging optogenetic tools (reviewed in ). A large number of genetically encoded fluorescent and luminescent indicators of calcium concentration [42, 44–46], voltage [47–49] or neurotransmitter release [50–52] are available, some of which have already proven effective in zebrafish [53, 54]. Activating proteins, such as channelrhodopsins and LiGluR, and silencing proteins, including halorhodopsin, have recently been used in zebrafish to link targeted neurons conclusively to their roles in simple behaviors [55–60]. To take full advantage of these methods, more specific lines expressing transgenes in subsets of tectal neurons will have to be generated. Extrapolating from the rapid pace of recent discoveries, we expect that many of the anatomical components of the tectal circuitry will soon be understood in terms of their function in visual perception and behavior. The mammalian superior colliculus also receives topographically organized retinal inputs and, like the tectum, has a stratified architecture that is principally visual in the superficial layers and multimodal with motor outputs in deeper layers . Although extrinsic collicular circuits, including a number of command projections from the forebrain, are better characterized in mammals and birds than in zebrafish, understanding of the micro-circuitry is sketchy. In this way, investigations in different vertebrate species are complementary, and findings from one enable targeted studies in the other. Mammalian equivalents to SINs would be an appealing first target. The means by which PVINs and other tectal interneurons filter visual information could also be shared between fish and mammals, and as these processes are elucidated in the tectum, they will probably provide insights into collicular function. More broadly, studies in the tectum have provided glimpses of how a three-dimensional array of neurons, whose architecture is simple by central nervous system standards, can filter input, represent visual space and detect motion. Genetic, behavioral and optical access to the tectum should allow the underlying cellular mechanisms to be described in the coming years. As these details emerge, we will probably learn important fundamentals of how diverse neural networks function. We thank the members of our laboratory for discussions. Work in the authors' laboratory was funded by the National Institutes of Health, the March of Dimes Foundation, NARSAD and HFSP.